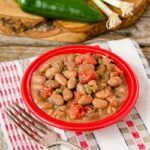 Southern-style pinto beans get a spicy kick with jalapeño peppers, green onions, and tomatoes in this flavorful side dish. Place beans in a large Dutch oven or soup pot. Cover with at least 3 inches of water. Soak beans overnight. Drain and pick through beans to remove any bad beans or small rock bits. Return soaked beans to the pot. Add salt pork, jalapeño peppers, green onions, garlic, tomatoes (with juice), and 4 cups of water. Stir to combine. Bring to a slow boil over medium-high heat. Reduce heat to low, cover loosely, and simmer for 3 hours or until beans are tender. Gently stir occasionally. Add more water if needed during the cooking process. Remove and discard salt pork slices. Season with salt and pepper to taste (I added about 1 teaspoon of salt and 1/2 teaspoon pepper). Prep time does not include soaking dried beans overnight.